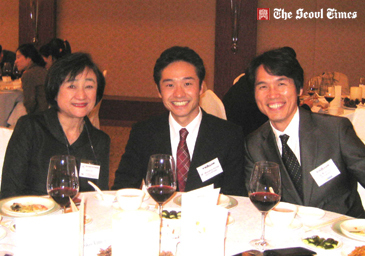 Mr. Masahiro Kondo (center), general manager of Alpha Resort Tomamu, poses with Ms. Hiroko Tani (left), executive director of Japan National Tourist Organization (JNTO)'s Seoul Office, and Mr. Hue Kim, CEO of Uniholiday at launching party at the Westin Chosun Hotel in Seoul on Dec. 10, 2008. Equipped with over 15 first-class restaurants, a shopping mall and boutiques, a wedding chapel, and a giant indoor wave pool, the Alpha Resort Tomamu in Hokkaido is rated as one of the best sports-oriented resort hotels in Japan. The ski and snowboard resort, located at the foot of Mount Tomamu in Shimukappu-mura, Hokkaido, Japan, has just started offering its service to local Korean tourists. 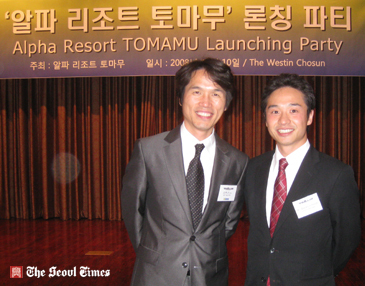 In a celebratory ceremony at the Westin Chosun Hotel in Seoul on Dec. 10, 2008, Masahiro Kondo, general manager of Alpha Resort Tomamu, officially launched the opening of its service through its Korean sales agent "Uniholiday." The luncheon party attracted over 100 guests from local tour & travel and airline industries as well as media. Mr. Masahiro Kondo (right), general manager of Alpha Resort Tomamu, poses with Mr. Wada Keiji (left), director of the Hokkaido Tourism Office, and other participants. From the Japanese side came Ms. Hiroko Tani, executive director of the Japan National Tourist Organization (JNTO)'s Seoul Office, and Mr. Wada Keiji, director of the Hokkaido Tourism Office. Prior to the luncheon, General Manager Masahiro Kondo gave a brief presentation about the Alpha Resort Tomamu. He said that the Alpha Resort Tomamu signed a business deal with Uniholiday to market its services in South Korea. Uniholiday now serves as Alpha Resort Tomamu's Seoul office. Uniholiday is already South Korea's sales representative for one of Malaysia's largest resorts, Sutera Harbour. 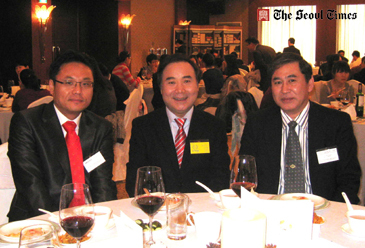 Mr. Hue Kim (left), CEO of Uniholiday and Mr. Masahiro Kondo, Alpha Resort Tomamu general manager. Last year, Uniholiday signed a memorandum of understanding (MOU) with Sutera Harbour resort in Kotakinabalu, Malaysia. For this agreement, Mr. Ravi Kathiravelu, chief operating officer of Sutera Harbour, and Mr. Eugene Yau, director of sales and marketing of Sutera Harbour, visited Seoul. Located approximately two hours from Sapporo, the Alpha Resort Tomamu is one of the most luxurious winter resorts in Hokkaido. It offers a huge range of state-of-the-art facilities and a variety of winter activities for holidaymakers - particularly for families. The Alpha Resort Tomamu is easily reachable from the three airports on the island of Hokkaido. The combined area of the resort is 1,000 hectares, the size of 213 ballparks. The resort offers accommodations with various pricing options to match the needs of customers, up to and including 5-star hotels. Mr. Wada Keiji (right), director of Hokkaido Tourism Office, poses with the local Korean participants. The most luxurious of the hotels is the Galleria Tower which offers rooms with private jacuzzis and sweeping, panoramic views of the mountain and resort area. This Galleria Tower is highly recommended for tourists with deep pockets or for those who are ready to spend a little more for their holiday. However, this relatively luxury resort is accessible on any budget, since it offers various options depending upon the needs of the customers. The resort boasts over 15 first-class restaurants, a shopping mall, boutiques, a wedding chapel, banquet hall, a giant indoor wave pool, and top-quality spas and saunas. Tomamu's other amenities include fishing, horseback riding, common area high speed access, childrens' programs, and a pets-allowed program.